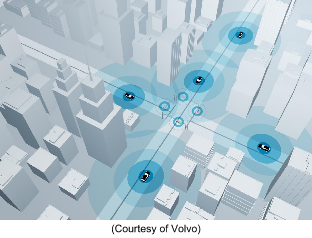 After more than ten years of research and development, vehicle-to-vehicle (V2V) communication is achieving a key political point that could decide when and how “talking” automobiles show up on our streets. Automakers and controllers see the innovation as a potential distinct advantage for street security. Preparing vehicles and roadside framework with unique radios that continually transmit and get data. This data includes vehicle pace, destination and braking and could decrease crashes by drivers by 80 percent, U.S. authorities say. However, there are a few obstacles automakers still need to pass thanks the politics. In the first place, the National Highway Traffic Safety Administration (NHTSA) is anticipating White House endorsement on a proposed principle to require every single new car to have vehicle-to-vehicle communication. Despite the fact that typically opposed to new directions, automakers say an order is required for this situation to set regular measures so the associated cars of various automakers speak the same dialect. In the meantime, a fight is seething over access to the radio frequencies that would be utilized by V2V frameworks. With automakers on one side and link suppliers as well as innovation organizations on the other. The Federal Communications Commission, which in 1999 cut out a spectrum of radio range only for certain related associated auto use, is currently thinking about approaches to impart that range to “unlicensed” clients, for example, wifi connected phone providers. NHTSA’s proposed V2V command is seen by strategy specialists as the most imperative stride for associated auto communication. In spite of the fact that the proposition hasn’t been made open, the command is seen as the least demanding way for automakers to work around common technical and security models. The proposition could be affirmed by the White House as ahead of schedule as this month, opening it up for open remark. On the other hand it could take any longer. With only eight months left of the Obama organization, the danger of a noteworthy postponement is genuine. The White House could require NHTSA to either give more investigation or wait until the FCC’s decision on data sharing. So if the White House can quickly muster-up some sort of proposal to kick-start sending vehicle-to-vehicle communication cars to the roads, I would be quite pleased. But nothing is ever that simple. Therefore, we must wait and eagerly cross our fingers.